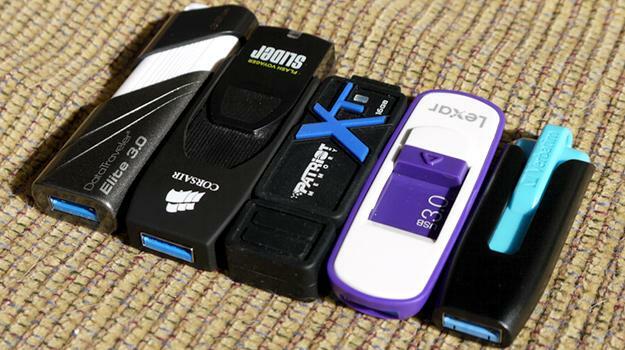 While they tend to look alike, USB thumb drives can vary significantly from model to model in performance. With the USB 3.0 standard boosting speeds up to 10x from USB 2.0, these gaps become even more significant. Each manufacturer makes different claims on the packaging, but how do you really know which is fastest? We’ve rounded up five popular models to find out: the Corsair Flash Voyager Slider, Patriot SuperSonic Boost XT, Verbatim Store n’ Go V3, Kingston DataTraveler Elite and Lexar JumpDrive S73. We will be taking a look at performance in three different tests to determine just how quick these drives are. Before we take a look at the hard numbers, however, let’s examine how each drive stacks up in day-to-day use. The drives we tested used different designs that handled common problems in unique ways. All of the drives are sliders – the USB plug is concealed when not in use – except for the Patriot Supersonic Boost XT. Among these, the Lexar JumpDrive S73 and the Verbatim Store n’ Go V3 are the standouts. Both offer simple sliding mechanisms that can be operated with one hand. Corsair’s Flash Voyager Slider proved hard to operate due to an extremely stiff sliding mechanism that made one-handed operation difficult. The Kingston DataTraveler Elite 3.0’s slider is quick to open but hard to close. We also had problems with the slider mechanism being too easy to activate when plugging the drive in to a USB port. The Patriot drive, unlike its peers, uses an old-fashioned cap. The obvious downside is the fact you might lose the cap, but opening and closing it was easier than operating the sliding mechanisms on the Corsair and Kingston drives. Patriot’s entry was also the only drive we tested to use a rubberized exterior instead of plastic. We didn’t take a hammer to these drives to prove longevity, but we suspect the Patriot would respond better to being crushed or dropped. Verbatim’s V3 is the smallest and most portable of the drives, followed closely by the Lexar JumpDrive and Patriot SuperSonic. The other two drives were a good quarter-inch to half-inch longer. Kingston’s drive was the hardest to pocket due to its length and the difficult slider. One area where these drives don’t differ much is price. The Corsair, Kingston and Patriot drives all typically retail for about $20. The Verbatim and Lexar drives undercut that pack slightly by selling for just above $15. We started out benchmarking by testing synthetic performance. 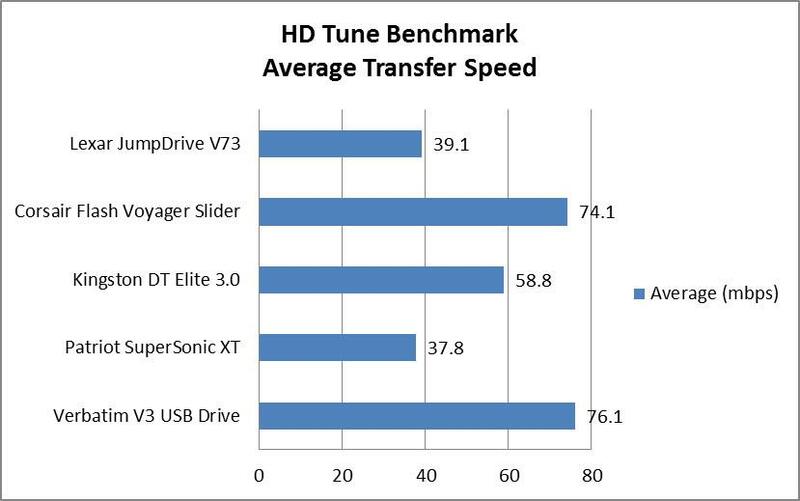 In this test ran HD Tune, a popular hard drive benchmarking suite, and took away from it the average transfer speeds of each drive. What were the results? Here we can see there is a significant difference between the drives. The quickest are the Corsair Slider and the Verbatim V3 while the slowest are the Patriot and Lexar drives. Kingston’s drive lands smack dab in the middle. Synthetic benchmarks don’t say it all. Real-world performance is of critical importance. To test it we used two different file transfer tests. The first of these involved copying Diablo 3 to the drive and back to the test computer. A game, like most programs, includes a number of files both large and small. This workload is similar to what will be experienced by anyone who likes to load portable programs on a flash drive. Our write test results differ significantly between the drives. Verbatim’s inexpensive V3 suddenly drops way behind the pack. 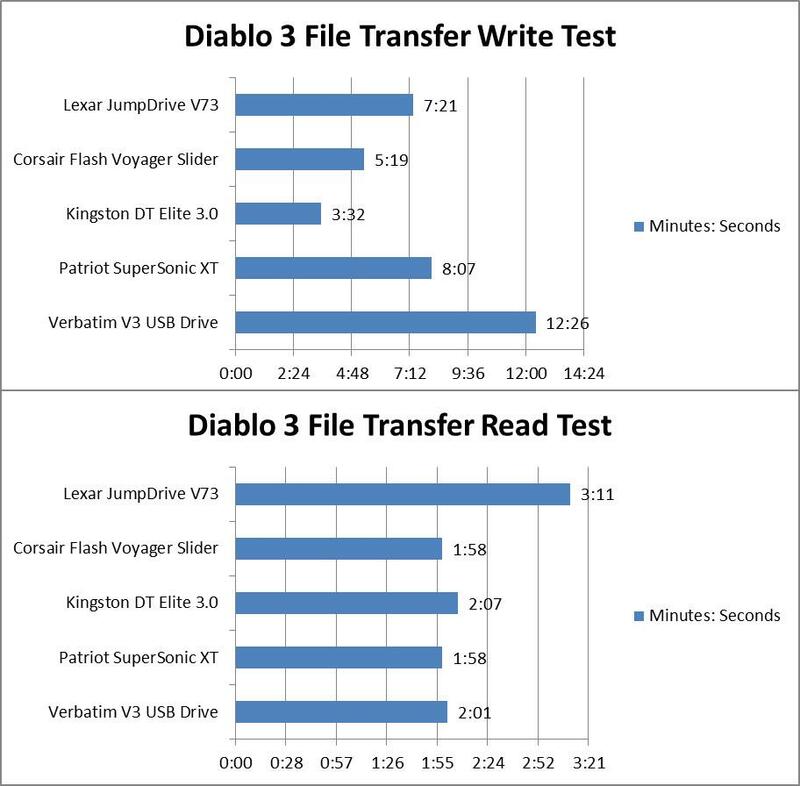 It transferred the Diablo 3 folder nearly four times slower than the Kingston DataTraveler Elite, the quickest drive in the test. Corsar’s slider is the second-quickest drive, followed by Lexar and Patriot. Read results were very similar with the exception of the Lexar offering. It came in significantly behind the field. Our second test is a large-file transfer test consisting of 500 MB video files totaling 6.5GB in size. This workload represents a scenario more familiar to photographers, amateur filmmakers and digital artists. These results exactly echo our previous ones, albeit it with shorter transfer times across the board. Verbatim is once again way behind the pack in write times though it also leads the pack in the read test. Kingston’s drive is the best performer overall, followed next by the Corsair. Lexar’s drive again posts poor results in the read test. The difference between the synthetic and real-world results is due to the benchmark. The test we used gauges both read and write speeds and then averages them into a result. Verbatim’s drive, the slowest in our write speed testing, put up good numbers because its good read performance balanced out any disadvantage. Kingston’s DataTraveler Elite 3.0 is the obvious performance standout. It is significantly faster than the other drives in our write tests. This seems to be at the expense of read performance, where it was constantly the second slowest. But who cares? Sacrificing 10 seconds in read tests seems worth gaining minutes in the write test. These results make it clear that the drive you buy is important. Yes, they all use the same USB standard and are sold at similar prices, but the memory and controller inside them differs. The gap in performance between the best and worst is dramatic. Kingston’s DataTraveler Elite 3.0 is the overall winner and is the only drive to walk away with our Editor’s Choice award. We don’t like the finicky slider’s tendency to accidentally open or close, but we can’t ignore the benchmark results. Kingston’s drive proved far quicker in our write speed tests. Quicker products are often more expensive, but the DataTraveler Elite 3.0 isn’t. It can be purchased for just $19.99 online. Our Recommended award goes to the Corsair Flash Voyager Slider and the Patriot Supersonic Boost XT. Corsair’s drive was second overall in our performance metrics and its slider, though stiff, is more reliable than that of the Kingston. Patriot’s drive received its award because of its respectable performance, small size and rugged exterior. Both drives are typically sold for $19.99. We can’t bestow the Lexar JumpDrive S73 or Verbatim V3 with honors. The small size and excellent sliders found on these drives were negated by performance hiccups. 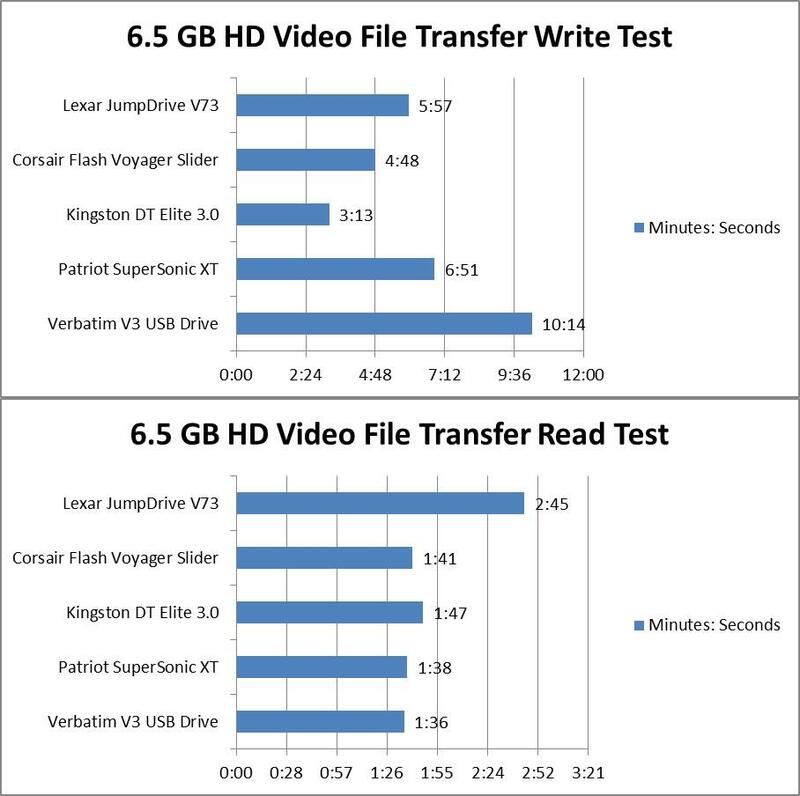 Verbatim’s drive was painfully slow in our write tests and Lexar’s drive was far behind the pack in our read tests. These drives are $5 less than the competition, but that’s barely more than the price of a venti latte. We suggest skipping coffee for a day and buying the Kingston DataTraveler Elite 3.0.